I was stymied in my efforts to name this sculpture. Marji and I ran through a series of names but nothing stuck. My daughter Amy, home for a visit, studied it for a while and said "Zen." We all knew it was right! 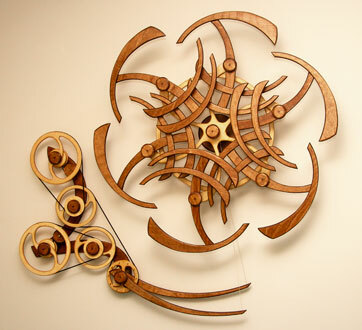 The Variation series is the result of my continued exploration in the world of kinetic patterns created by six overlapping wheels that orbit a common center. Each orbiting form is designed to hold a particular orientation by rotating in the opposite direction from its orbital motion. I first "discovered" this kaleidoscopic effect in my sculpture called Rhapsody, took it a step further with Quark Cotillion and got serious about exploring this effect with the Variation series. DCR: Thank you! Glad you like it. DCR: The edition of Variation Zen is sold out including the prototype. Variation Dream is the closest thing to it in the current line. The oriental motif in Variation-Zen is one that continues to fascinate me but I have nothing in the planning stage that incorporates it. I've been exploring the 4 overlapping satellite wheels as in Quandaryrather than the 6 in the Variation series. I wonder if the oriental motif would work? I'll let you know if I come up with something!